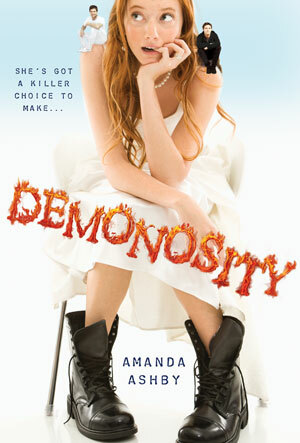 Amanda Ashby has a new book out this week–DEMONOSITY–which sounds so fun and cute! The Black Rose–a powerful ancient force–has been let loose and has taken up residence in Celeste Gibson, popular girl at Cassidy Carter-Lewis’ high school. Thomas Delacroix is the spirit of a fourteenth-century knight who is devoted to protecting the Black Rose, but he needs a contemporary living being to take on the challenge. That’s where Cassidy comes in. She’s a quirky high school junior who just wants to dress in her vintage clothes, hang out with her best friend, and take care of her father, who is recovering from surgery. She’s the last person who would ever volunteer for such a task, but no one actually asked her. Now, like it or not, she finds herself training before dawn and battling demons at parties, the mall, and even at school. But hey, no one ever said high school was going to be easy. I’m loving that Buffy vibe in the description! Amanda Ashby took some time to answer a few questions for me below. To learn even more about her and her books you can, check out her website, or follow her on Twitter or Facebook! Amanda Ashby: At eight my sole ambition was to marry Will Robinson from Lost in Space and I remember quite clearly trying to break his leg so that I could then race in and care for him. At eighteen I had decided it might be quite good to be a journalist but three weeks after starting my college degree in the subject I realized that telling the truth all the time was not for me. At twenty-eight I had finally put the pieces of puzzle together and realized that anyone could think of breaking a leg as a plot device to get two characters together (and who seemed to hate telling the truth) was probably destined to be a writer. AA: Fringe girl! I was always a bit left of centre at school, though I’m not sure I even knew it. However, when I look back at the secondhand shopping I used to do and all the strange outfits I used to wear, I realize I wasn’t quite like other girls (which is of course why I loved John Hughes movies so much and why I still haven’t forgiven my husband for throwing out my Pretty in Pink album during one of our moves). AA: Toward the end of the book Cassidy has had a fight with Thomas—who is medieval demon knight. Unfortunately he can’t travel forward in time so he is just an apparition and the only way for him to see what’s happening in her time is through the eyes of an owl. Anyway, after this big fight she goes out for a run and the owl/Thomas is flying beside her, trying to get her to stop. She is so mad at him and so upset that even when I think about it, I can feel her fury rising up through my chest. It was a really wonderful scene to write. Plus, you know, it had an owl, which is always cool! AA: Thank you for making that a plural. For a moment there I thought I could only list one! Anyway some of my favorites are: Breakfast Club, Pretty in Pink, Princess Bride, Clueless, Jurassic Park, Star Wars, Love Actually, Pitch Perfect, Sense and Sensibility (Emma and Kate version), Galaxy Quest, Serenity, The Avengers, Shaun of the Dead. AA: Easy! It’s the Beatles because my husband is a Scouser (which means he was born and bred in Liverpool) and I lived there for six years – some of that time just down the road from Ringo’s house. And also because Blackbird is one of my favorite songs in the world. That Time I Fangirled My Own Character. Sort of.